[Steve] was tired of looking at the speakers in his workshop and began searching around for something a little more aesthetically pleasing. Having recently received a set of hollowed out books used for hiding things as a gift, he thought that he might be able to solve his speaker issue in a similar fashion. He grabbed a couple of books from a local thrift store and promptly removed the pages. They were replaced with cloth-covered plywood to make the device more sturdy while simulating the look of pages. 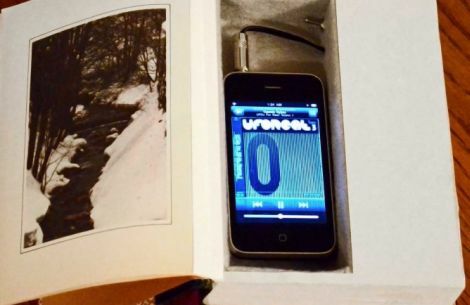 He mounted his speaker inside one of the books, and in a second installed a small 7W Class A amplifier. A third book houses a padded compartment to hold his iPod, completing the set. [Steve] reports that the speakers are pretty much undetectable, and the sound quality is decent too. In fact, we’ve started looking for some old books to re-purpose in our workshop as well. Looks like all the screen information about songs and such will also be undetectable! Awesome way to keep shop dust off the player though, and an interesting project! But kudos for it looking good, and doing what it was designed to do. The chip amp in that kit is most likely operating in class A/B not class A. I see no reason why Velleman would bias it into class A. The TDA2003 is class A/B by default. But anywho, the choice of amp makes more sense now. Why someone would go class A for something that low fidelity was beyond me. personally, id much rather hear good quality audio vs not see the speakers making the sound. I saw the inventor talk about them on TED. I think HAD even has an article about it up somewhere. Who worries about speaker aesthetics in a workroom? @Sariel… he could have used those but then would have most likely needed a 2nd mortgage to pay for them leaving him no money left to do things in the shop…and if he moved two steps to the left he would no longer have been able to hear his lovely FM radio ! Tom Dowad has updated components for the project titled InstaBeat LE MP3 Player.